There are some workshops scheduled for school on-site professional development conferences. Contact Angela for more information about attending one in your area or scheduling one for your school. Below is the Guided Math Workshop Event Registration form. SCROLL down to find the form with the location you want to attend. The Payment processor is through Paypal, which will process any credit card. It doesn’t mean you have to pay with Paypal. If you have to pay with a purchase order, do NOT fill out the registration below. Email Angela at angela@guidedmath.expert to register your crew. Fill it out and a confirmation email will be sent to you. Guided Math Professional Development Workshop is coming to Columbia, SC on June 12, 2019. Angela Bauer will describe how to transition to this Guided Math framework, detail the process to collect data for planning for Guided Math teacher-led groups, discuss superior Guided Math resources for math stations, and more. Guided Math framework allows teachers to meet individual needs within math groups. This innovative approach to teaching math concepts is redefining how math is taught in schools. Most of the instruction takes place in small guided math groups that are leveled for the student’s needs. Meeting individual needs is accomplished through frequent intervention, daily math fact practice, differentiated instruction, and technology opportunities. The flexible skill groups teach problem solving skills, math thinking skills, test taking skills, and active learning. These skills lead to better mastery of math skills, increase standardized test scores, and result in students making adequate yearly progress. This professional development workshop will show teachers how to transition to the Guided Math Format. Angela Bauer, creator, details how to plan for differentiated leveled math groups and prepare guided math stations for spiral review and concept mastery. Angela shares websites, resource books, and aps that help teachers to transition to Guided Math. This workshop is designed for teachers in Kindergarten through middle school. A variety of schedules will be given to attendees to use, depending on the grade level and school schedule. There is even one to use with a middle school block schedule. Past participants valued the following that they learned at the Guided Math conference. Angela will help teachers transition to this Guided Math format. She compares and explains the differences between this and guided reading. Her students use Daily 5 and CAFE strategies along with Fountas and Pinnell ideas in reading. 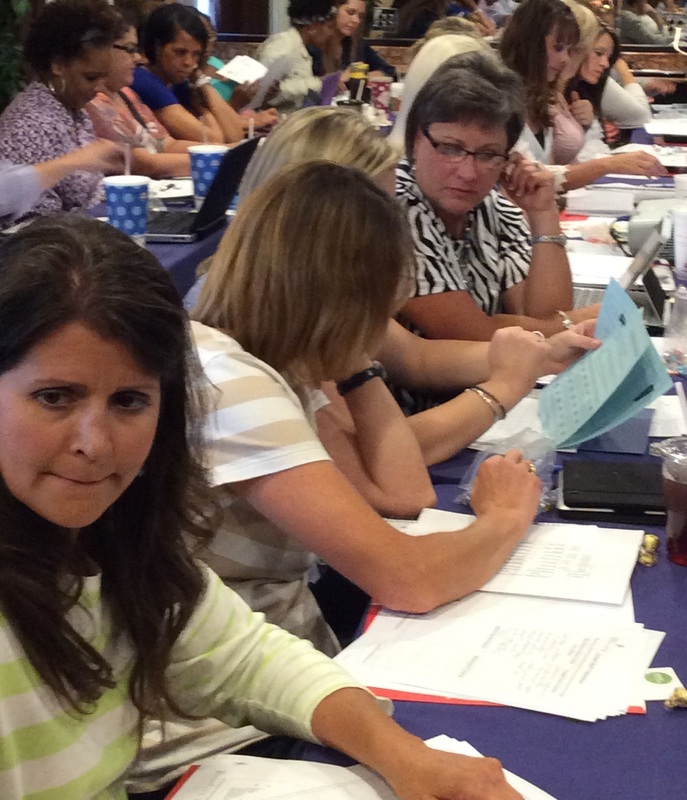 Teachers will learn how to use guided reading strategies in guided math. Expected behaviors are described and details are given on how to teach students these behaviors. Mrs. Perry also details how to use intentional teaching of standards when planning for each station along with teacher-led groups. Students have choice within a station as well as differentiation for needs. Most teachers really appreciate the fact that Angela still teaches because she shares her tips on using data to plan lessons, on incorporating spiral review, on getting ongoing assessments as well as mastery assessments, and using intentional teaching to meet differentiated student needs. Setting up guided math groups can be easy! Principals, if you need to register using a purchase order, email the names of your teachers, grade levels, and email addresses of your teachers to angela@guidedmath.expert Then Angela will send you an invoice and see that your team is registered.